Mailed 7/6/18 to Subscribers. Allow 4-6 weeks for USPS delivery. 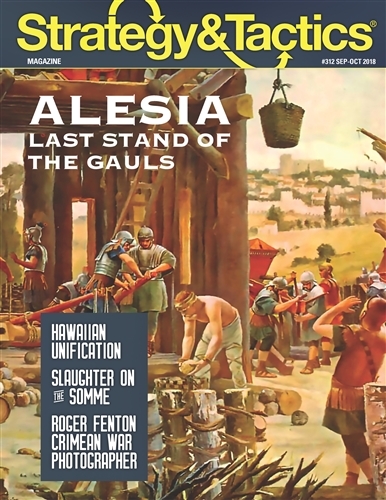 Alesia - Last Stand of the Gauls: The campaign of 52 BC, between Vercingetorix's Gauls and Caesar's Romans, ended in an epic confrontation around the fortified town of Alesia. Hawaiian Unification - The Campaigns of Kamehameha the Great: By sheer determination, military skill, and political acumen, Kamehameha the Great united the Hawaiian Islands into a single kingdom. Big Push - Slaughter on the Somme: The massive July 1916 Anglo-French offensive along France’s Somme River was expected to break the German line. Instead, it resulted in a bloody five-month slog causing over a million casualties on both sides. Roger Fenton - Crimean War Photographer: One of history’s first modern war correspondents experienced the Crimean War at close range.